A lot of people joke around when claiming to have certain obsessions. You might say you’re hooked on chocolate or addicted to your favorite TV show. You might even say you’re addicted to sugar, but if you did, you might actually be right. Recent studies have shown that sugar triggers activity in our brains that is similar to the effects of certain illegal and highly addictive drugs. Whether you have a full-blown sugar addiction, or you just battle the occasional cravings, there are ways to kick the habit and to ignore the cravings. Your body, your mind, and your overall health will thank you. The famous study that demonstrates the addictive power of sugar was conducted at Connecticut College and reported on in 2013. The researchers used Oreo cookies, cocaine, and morphine to see just how addictive sugary foods can be. They found that the cookies stimulated more neurons in the pleasure center of the rats’ brains than either highly addictive drug did. This was not the only study to show how addictive sugar is. Others have proven that rats conditioned to use both addictive drugs and to eat sugar, most often take sugar over drugs when given a choice. Sugar, like addictive drugs, causes a release of dopamine in neurons in the brain region dubbed the pleasure center. Dopamine is a neurotransmitter than makes us feel good. We feel its effects in all kinds of happy situations, like winning a game or getting a hug. The effect is natural, but when a substance causes a flood of dopamine, it sets us up for getting addicted to that feeling. The result is that we crave the substance and tend to consume way too much of it. This happens both with illegal drugs and sugar. Our desire for sugar has its roots in evolution and our survival as a species. We modern humans have a genetic mutation that makes us crave fructose, the natural sugar found in fruit. That gene also allows us to metabolize fructose in an interesting way. When we eat more fructose than we can immediately burn off with exercise, we store it as fat. This fact is at the root of why sugar is so bad for us in large quantities. 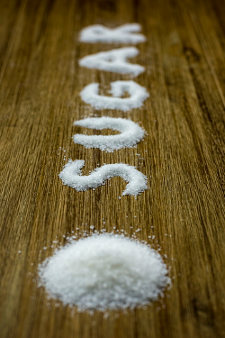 Most types of sugar we eat, table sugar, honey, fruit sugars, and others, are at least half fructose. We eat it in excess and end up with excess body fat. Millions of years ago, our ape ancestors that developed this mutation were saved by it. When food was scarce, those with the mutation could binge on fruit and store extra energy as fat to be used later. Those without the mutation were more likely to die of starvation. They couldn’t store the energy from fruit for times when food was hard to come by. Excess sugar leads to obesity. Obesity is a major risk factor for a number of diseases like diabetes, heart disease, high blood pressure and stroke. Sugar leads to fat. When you consume too much sugar you build up high levels of a type of fat called triglycerides. High triglyceride levels in the blood increases the risk of heart disease. Too much sugar can kill you. These things are all related of course, but studies have actually shown that people who eat more than a quarter of their daily calories in the form of sugar are twice as likely to die from heart disease as those limiting sugar to ten percent of calorie intake. Tooth decay is caused by sugar. Sugar promotes tooth decay because it provides food for the bacteria living in your mouth. Sugary foods can lead to malnutrition. When your diet is high in sugary foods, you probably aren’t getting enough of the nutrients you need to be fully healthy. You need a variety of foods and those high in sugar don’t generally provide it. The disaccharides you’ll find in your foods are sucrose, made of one fructose and one glucose, maltose, which is made of two glucose units, and lactose, made of one glucose and one galactose. Maltose is found in malted grains and lactose in milk and other dairy products. Sucrose is the sugar you find most often in your foods. It is your table sugar and is made from sugar beets or sugar cane. It is the main added sugar, but is also naturally occurring in fruits and vegetables. The goal of reducing your cravings for sugar and eliminating a lot of sugar from your diet is to get rid of added sugars. You don’t need to worry about the sugar naturally found in whole foods like fruits, vegetables, grains, or dairy. You want to target processed foods that have added sugar, as well as the sugar bowl on your kitchen counter. The best way to cut out added sugar is to eat as many whole foods as possible and limit processed foods. Smoothies are great for this goal because you control what goes into them. If you only use whole ingredients, like fruit, vegetables, dairy, nuts, and superfoods, then you can craft healthful, low-sugar meals and snacks every day. Totally cutting out processed foods isn’t practical for most people, so it helps to read labels. Sugar is hidden in a lot of places you wouldn’t expect. Some of the biggest culprits, besides the obvious sweet treats like candy, are salad dressings, yogurt, spaghetti sauce, breakfast cereals, and bread. The experts at the Mayo Clinic suggest that you avoid any food that lists more than five grams of sugar per serving on the nutrition label. Yogurt can be a little tricky because it contains natural lactose. One eight-ounce serving of yogurt should have about 12 grams of lactose naturally. You can figure out how much added sugar yogurt has by subtracting 12 from the total. If it’s five grams or less, it’s ok. If you can cut out processed foods with more than five grams of sugar and eat more whole foods, you can end your sugar addiction for good. Sounds easy enough, right? Of course you are going to experience cravings as you try to reduce your sugar intake. Here are some tips to get past them and to resist the urge to binge on sugar. Transition from sugary foods to fruits. There is a limit to how much fruit you should eat because of the sugar, but as you’re just learning to cut back, eat as much fruit as you want. When you feel a craving for a candy bar or cookie, eat a piece of fresh fruit instead. Beware of natural sweeteners. Natural sweeteners like maple syrup and honey are better than refined sugar, but they are still added sugar. Avoid or limit these until you have your sugar cravings under control and then use sparingly. Watch out for starch. Starchy foods are made of complex carbohydrates, but they break down into sugar quickly in the body. This means they contribute to your sugar habit. Avoid potatoes, white rice, and foods made with refined white flour, like crackers, pasta and pretzels. Substitute these with foods made with whole grains like brown rice or whole grain bread and pasta. Fill up on fiber and protein. When you’re hungry, you’re more likely to give into your sugar cravings. Both protein and fiber help keep you full so add them into your daily diet. Eggs, Greek yogurt, nuts, beans, and whole grains are good choices. Don’t rely on artificial sweeteners. Research suggests that artificial, zero-calorie sweeteners do nothing to satisfy your sugar cravings. Keep sweets out of the house. Sometimes resisting the urge to eat something sweet is overwhelming. In these moments no one can be expected to have a will of steel if there are cookies sitting in the cupboard. If you don’t keep sugary foods in the house, you can’t give in to those cravings easily. Watch out for your sugar triggers. As with any addiction, there are triggers that get your sugar craving going. Is it stress? Do you want sugar when you’re bored or tired? Do you associate having a pastry with your midday coffee? Learn to recognize your triggers and either avoid them or substitute a healthy food or activity for the sugar you would normally reach for. Get some exercise. Exercise is a natural high, so when you feel a craving for sugar, go for a walk instead and get some fresh air. Add spices to your food. Spices like cinnamon, nutmeg, and cardamom add flavor to foods when you’re missing sugar, but they also help to regulate blood sugar. Try these in your smoothies. Eat mineral-rich foods. Being deficient in minerals, especially magnesium, chromium, and zinc, can make sugar cravings worse. Add sweet potatoes, nuts and seeds, broccoli, eggs, and whole grains to your diet to get the minerals your body needs. Manage stress. This may be the most important tip of all for resisting sugar cravings. When you manage your stress, you feel better, and you are less likely to reach for sugar. A healthful diet, exercise, staying hydrated, getting enough sleep and using relaxation techniques will all help you to reduce and manage the stress in your life. Sugar is not evil, but the way in which most people consume it leads to devastating health problems. It’s hardly our fault. The processed food industry has packed our foods with sugar to keep us coming back for more. Knowledge is power, though, and now that you know about sugar, you can take steps toward better health. You don’t need to, and shouldn’t, totally cut sugar out of your life. You should cut down drastically on added sugar. It will be challenging at first, but if you stick with it you will find that your cravings disappear. Do you have a sweet tooth? What strategies have you used to reduce your cravings? Please share in the comments below. Your title is so amazing. I think natural sugar from fruit is very healthy but refined sugar is very dangerous for people. In my opinion, we should reduce our sugar level to avoid obesity, tooth decay… Your title is what people should read. Thanks. Nice to hear you like this article and its message, Jennifer. Everyone can benefit from reducing their sugar intake, especially refined sugar. Really worth reading. . and of course. . practicing. .
I’ve been very keen on my sugar intake since I was a teen.. and so glad I have it all under control for the past decade or so.. it’s a blessing to be able to resist a whole lotta chocolate and ice cream that’s sitting in your fridge. .
Just wanna add in another tip that I follow. . use vanilla. . this really helps.. Kudos for taming your sugar cravings :) Thanks for the vanilla tip. Finding ways to satisfy your sweet tooth without actually consuming sugar is a great strategy. getting the guilty feeling after taking too much sugar is a common feeling, so you can keep sharing such posts which will help us guys to get over such guilt trips and get proper knowledge. I know that guilty feeling all too well. Good information and not being too hard on yourself is a recipe for kicking a sugar habit. Great topic! Thank you for your article, it is very detail and helpful. Too much sugar can cause many problems for our health, especially obesity and tooth problems. And it is very difficult to cut it down because eating it can be considered as our daily habit. I’m glad that I read your article and can beware of it from now on. Thank you. I read this post with great interest. The truth is that I like sugar and cakes. I understood it is not a healthy eating way. I must change my way eating strategy. It’s not easy. Most of us love sweets, Terry. Try incorporating healthy foods into your diet that “crowd out” the sugary as opposed to trying to just eliminate the sweets. I am a sworn sugar addict and could never imagine a day when this addiction would be gone. This is a great method to overcome this addiction. I will report back how it turns out. Thanks Ryan. Good luck kicking that sugar addiction to the curb! Protein powders: This may seem like a good way to get protein in your diet, but natural sources are a better choice when it comes to weight loss, IMO. Protein powders are good for bulking up and adding weight. For weight loss, stick with vegetables and other healthy sources of protein such as nuts, seeds, gelatin, and Greek yogurt. Caveat, for anyone that requires more calories than normal due to age and lifestyle factors, a reputable protein supplement is perfectly acceptable. I would continue using the vanilla protein powder if you like it. I prefer natural sources of protein when possible. I’m happy you found my smoothies too, Maryanne :) Liquid vanilla, as in vanilla extract, sure. Don’t really think this article will help many people who can’t control their addiction. I tried keto and for me and a lot of people, this gave a way to CONTROL what goes into my mouth. But as soon as I ate sugar again, the uncontrolable craving came back! Keto also took away my knee pain which in itself gives me strength to keep at it. I appreciate your honesty, Joann. Do you have ideas for folks with a severe sugar addiction? Keto is very popular and many folks are having success with it – awesome to hear it took away your knee pain.